I just purchased a pockex last week, and it gets extremly hot when charging, I charge with usb on computer or a cube ( electrical) I've also tried changing the usb cable, and it still gets so hot i can't touch it when charging . I love this device so much, but scared to charge it ! If it is genuine Aspire, the unit has a 3 month warranty. Return it to the retailer where you purchased it for a refund or replacement. In either case. for your own safety, DO NOT attempt to charge the unit any further! Where did you buy it from? What did they say? I use a 1A charger and the PockeX does get hot at the bottom, however it takes a looooot more heat in order for it to become dangerous. I'm having the same problem with my pockex getting really hot that my scared to finish charging it.Im try to use a apple wall plug with it ? What the best one to use? I as well have this issue. I plug the cord into my computer seeing that it is the only way I can charge it at the moment. Is it possible to use an adapter and plug it into my wall? I just recently got it this past weekend. I'm too scared to let it fully charge in fear of frying the battery or worse. Please help! The mod should NOT get hot when charging....it may be a fake...did you check the authenticity scratch off against Aspire website? I would return it to the retailer where I bought it for a replacement or refund as this should not happen with the Pockex Mod if it is authentic. I have 2 of these and they NEVER get hot while charging! Mine gets quite hot too, only at the base of the device. I can still touch it but it's not far from being too hot to touch. It is a genuine Aspire product, brand new. 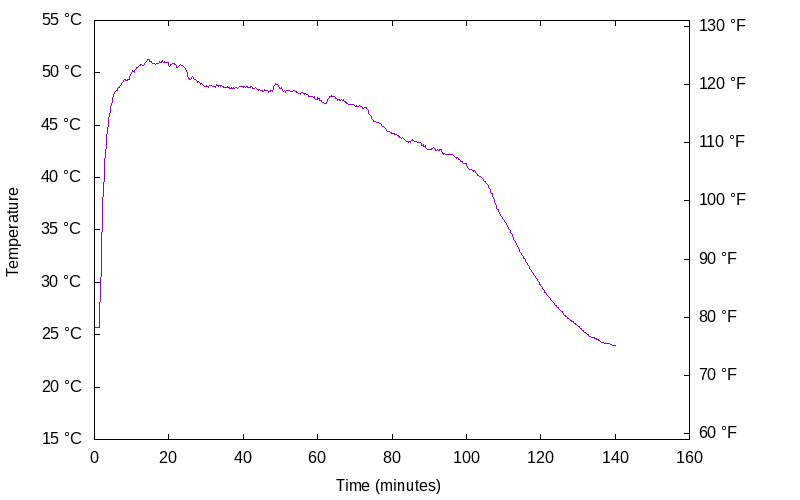 I graphed the temperature of the bottom of the device over time while charging. I started with an empty battery, the charging starts at 1 minute. I used the USB port of a laptop to charge it (so the current is limited to 500 mA). The max temperature was 51.3°C / 124.3 °F. If your situation seems to be worse than that, then I guess it's better to stop using your ecig.